During the 20th Century, the sea-side Greek city of Thessaloniki saw it all – fires, wars and earthquakes. This is the backdrop of Victoria Hislop’s novel The Thread. In it, we get to know the story of this city through a fictional cast of characters. As the book opens, Katerina and Dmitri’s grandson has come to visit. He asks them why they still live in this city, since their children and their families are all in England or the USA. The answer to his question is the story of these two people and this special city. 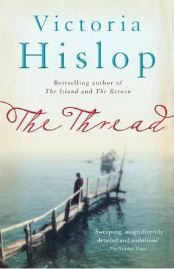 Novelist Hislop is well known for her love of the Mediterranean. Her first novel “The Island” was about Crete, and her second “The Return” was about Granada, Spain. Hislop attempts in each of her novels to bring her readers into the hearts of these locations. To do this, she weaves a web of characters into the histories of these places. This is even more of a perfect metaphor for “The Thread” since her female protagonist Katerina is a seamstress. But Katerina doesn’t just sew dresses; she creates wearable works of art. As for Dmitri – his father is the successful owner of a company that imports and sells fabrics. While this may sound like an easy set-up for these two to meet, Hislop doesn’t take the obvious route. She begins her tale with the city’s disastrous fire of 1917. This is just when Dmitri is just born and what forces his mother to move into a very poor neighborhood. Katerina, on the other hand, was born near Smyrna (known as Izmir, today), Turkey and ends up in Thessaloniki as a refugee. She ends up in the same neighborhood and so the stage is set. Of course, at that stage, the two are still very young children. This is what allows Hislop to tell their story, in parallel with the history of the city. This takes us through World War II and through to the earthquake of 1978. Such a vast backdrop makes for a story whose long timeline is close to epic proportions. So while 400 pages isn’t a short novel, it could have been much longer. The key to writing a successful story with such scope is balance. This means that the historical aspects shouldn’t overcrowd the characters, or the other way around. To a certain extent, Hislop succeed in this, but not completely. Where Hislop does succeed is in getting us to empathize with most of her characters. Certainly, we care about Katerina and all she goes through. This starts the minute we find her fleeing from the Turks. But soon after this, the focus seems to widen to other characters. For instance, there’s Eugenia, the woman with the twin daughters who becomes the de facto guardian of Katerina when she’s separated from her mother. There’s also the Moreno family – the Jews that own the clothing workshop who Katerina becomes neighbors with. Of course, without Dmitry, there is no continuation of the story. But as soon as his wealthy father moves him and his mother away from Katerina and into their mansion, there is a split in focus. In this way, Hislop separates the two stories of these main characters. But this isn’t done totally evenly, and the larger emphasis is from Katerina’s side. This isn’t actually as problematic as it sounds, and you can be assured that you be confused. However, some characters get sidelined along the way, while others fade in and out of the foreground. This can be partially forgiven since otherwise, the book would probably need to be twice as long. Where Hislop seems to have lost the balance is in the history part, at least in part. On the one hand, her readers need to understand what’s going on around these characters. Without that, certain motivations and actions don’t make sense. It also helps with the climax of the story. And after you’ve read the whole book, you’ll certainly feel that you know a good deal about this special city. However, there are sections that feel like you’re reading a very well written history book. There are also places where politics are described that border on the preachy. These sometimes break the flow of the story, and could easily have been edited down somewhat. Thankfully, Hislop does write in an engaging fashion so that these passages remain at least partially entertaining. Overall, The Thread is a very good read. Hislop gives us sympathetic characters in an almost exotic part of the world. She also tells this story on the backdrop of an era of so many upheavals that they completely change this city’s character. This combination had the potential for being a truly amazing epic. The problem is that parts of this novel are slightly unbalanced in terms of character focus. As for the extraneous historical background, readers might choose to skim over some of those sections. If so, they won’t be missing much. Considering all this, I’ll recommend this novel and give it a solid 3.5 stars out of five. No Comments on "The Thread"
Davida Chazan (aka The Chocolate Lady) was born in the USA and moved to Israel over 30 years ago. She's been reviewing books on the internet for over 12 years on various sites, including Dooyoo, Ciao and Yahoo! Contributor Network. Davida works as a Resource Development Associate for a Non-Profit Organization and lives in Jerusalem with her husband and three grown-up children. Davida is also a published poet as well as a gourmet of chocolate!